After Secret Wars is done, the Marvel Universe is going to look very different. Someone else is going to be the Strongest One There Is. Another wall-crawler will be using the name Spider-Man. Oh, and Wolverine—a Wolverine, anyway—is coming back, too. Alonso also said that character and creator diversity will be a big focus of the All-New, All-Different push. Based on the promo image above, it seems like original Captain America Steve Rogers will still be be the older version from before Secret Wars. The inclusion of Miles Morales—Peter Parker’s successor in the alternate reality Ultimate Universe—into the Marvel Universe is all but a given, too, with both this image and his recent appearance in an All-New, All-Different Avengers preview story. It’s a safe bet that he’s the new Spider-Man Alonso mentions. (He’s not a new creation, of course, but he’ll be new to the mainline Marvel Universe.) And the character on the far right is a version of 1970s-era Native American hero Red Wolf, who’ll be showing up in a Secret Wars tie-in title. 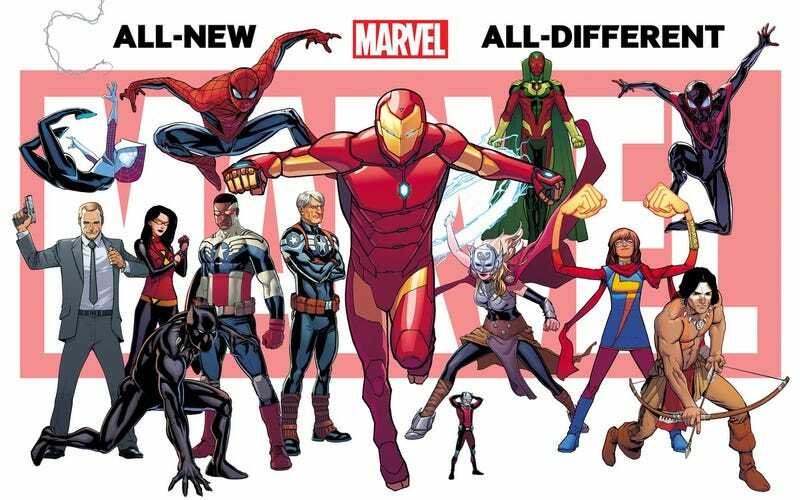 A teaser for the All-New, All-Different Marvel will be out in July, previewing the coming changes before the fall. Marvel’s premier super-team might need some crowdfunding soon.